A few days ago I was traveling on Route 66 between Catoosa and Weatherford, Oklahoma to film some interviews for the Pilot TV show I am producing about riding motorcycles on Route 66. Deb Mooney of Weatherford had planned to go on the ride I made in August between Chicago and Devil's Elbow to shoot footage for the Pilot, but she had to cancel at the last minute. So I arranged to interview Deb while I was in Weatherford. We agreed to meet for the interview at the original Lucille's, which was a Route 66 roadhouse and gas station in Hydro, Oklahoma that Lucille Harmon operated for over 60 years. The original Lucille's in Hydro, Oklahoma. Deb says she is a banker by day and a biker by night. She isn't kidding. Deb and her husband Perry (AKA "Scooby") are members of the Iron Plainsmen Motorcycle Club. The MC has three chapters: Geronimo's Bluff; Moscow Flats; and Dead Woman's Crossing, in which Deb and Scooby are members. It was raining when they rode up. Scooby was on a Heritage Softail and Deb was on a black Fatboy with ape hangers. I told her that riding in the rain to meet me for the interview was above and beyond the call of duty, and she replied "Well, you told me you wanted to get film of me on the bike." Deb Mooney is a full patch member of the Iron Plainsmen MC. I asked Deb about the meaning of "Dead Woman's Crossing." She told me that there are different versions of the story, all involving an unsolved murder and a haunted bridge. The one she understood to be true was a bit vague in detail. She said that back in the "stage coach days," a woman was crossing a field with her baby near a bridge that crossed Deer Creek. The baby died and in a fit of grief the woman killed herself. Deb was unsure whether the woman hung or shot herself. The bridge where all this happened became known as Dead Woman's Crossing. At night you are supposed to be able to hear the woman grieving the death of her child. Another popular account is that the crossing originally was called Dead Woman's Bridge. In this version, a woman was crossing the bridge when her daughter fell out of a buggy and broke her neck. The mother then hung herself in grief. At night you are supposed to be able to hear the sounds of the buggy crossing the now haunted bridge. Deer Creek and the new bridge at Dead Woman's Crossing. In still another grizzly version, a woman was crossing the bridge with her baby when she was attacked. The woman was tied between two trees and her head was cut off. The baby was never found. Under this legend, at night the woman can be heard walking up and down the bridge searching for her head and her baby. According to Wikipedia, a woman named Katie DeWitt James filed for divorce from her husband in 1905. The next day, Katie and her daughter Lulu Belle boarded a train in Custer City, Oklahoma. They were bound for Ripley to visit Katie's cousin. They never arrived. A few weeks later Katie's father became concerned that he had not heard from her, and he hired an investigator to, well, investigate. The investigator found that Katie and her daughter got off the train in Weatherford in the company of a prostitute who lived in Clinton. The next morning, the prostitute, Katie and her daughter left in a buggy. Two hours later the prostitute showed up back in Weatherford alone. Katie James with head attached. The investigator learned that Katie, the prostitute and the baby had been spotted near Deer Creek. He found the baby, who had been left with a stranger. The baby was unharmed, but was covered in blood. The investigator found the prostitute in a nearby town. She denied killing Katie, but the prostitute killed herself with poison later the same day. Katie's decomposing body was found about a week later near Deer Creek. She had been shot behind the ear with a .38 caliber bullet and the head was found several feet from the rest of the body. The bridge where all this happened has not existed since the 1980's, but a new bridge has been built nearby. The original bridge being gone, it's a bit unclear where you are supposed to go to experience any paranormal activity. Deb's chapter of the Iron Plainsmen took their name from this legend. They help to maintain the new bridge. The chapter currently has 14 members, but they have several prospects in the pipeline. The Club does lots of fundraising, including sponsoring benefits for veterans organizations, breast cancer funds, Toys for Tots, Special Olympics and St Jude's Hospital. Although Deb is proud to be the only female full patch member, she is not selfish about it. She is working to get more women into the MC. Sam Allen wrote The Motorcycle Party Guide to Route 66. 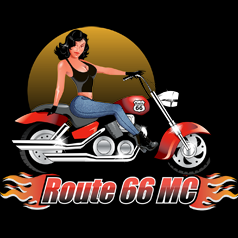 He also created www.route66mc.com, which is the most complete single source of information about Route 66 available on the web.